Sorry, we couldn't find any MINI Cooper Coupe listings that matched your search criteria. Here are Nationwide listings for a MINI Cooper Coupe. Here are our listings for all model years of the MINI Cooper Coupe. 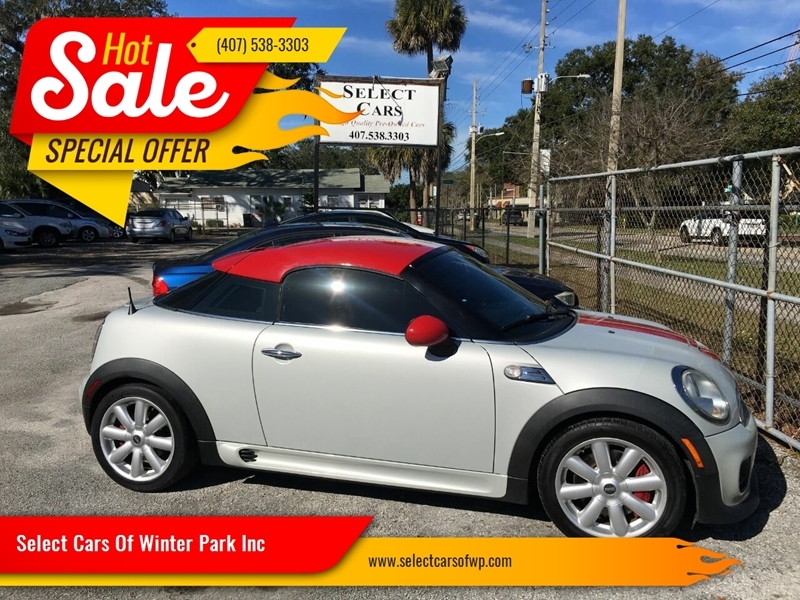 Sorry, we couldn't find any 2012 MINI Cooper Coupe listings that matched your search criteria. You might be interested in these similar years for MINI Cooper Coupe. Avg. Dealer Rating: (147 reviews) "Dealer does not respond to questions asked. Sent email asking for more pix, as there were limited ones and asked a few questions about Tacoma, since the Dealer’s website says “no known accidents”, but the CarGuru listing stated 2 accidents. Then I get email today, from Mike Walley saying he has been unsuccessful in getting a hold of me...I simply wanted a few more pix and a couple of answers, BEFORE some sales person hounds me to death...very shady operation, and appears to be heavy “sales” focused, as they want to ‘talk’ versus put something in writing. Do your homework, however I would not work with this group..."
Avg. Dealer Rating: (2 reviews) "I tried to contact this company to ask a simple question, only to jump through hoops with three different calls I had to answer! And they never answered my question!!!" Avg. Dealer Rating: (6 reviews) "Working with Ryan and Don was a great experience. I was coming from Michigan and they were very understanding in working with my local credit union. Love the car!" Avg. Dealer Rating: (13 reviews) "Quick response, but I ended up purchasing a different vehicle from a closer dealer." Avg. Dealer Rating: (27 reviews) "Customer service was helpful in providing information about the vehicle in question. I didn't follow through with a visit or purchase, however." Avg. Dealer Rating: (49 reviews) "Everything went as expected. No surprises. Very pleasant process." Avg. Dealer Rating: (31 reviews) "i brought this car. i would buy from them again.. love my car my over all experience was great. got my car loan at a low rate. they were the nicest people you would ever want to meet." Avg. Dealer Rating: (20 reviews) "Quick response... Reasonable pricing... When my lease on current vehicle expires in late June, I'll get back to this dealer. " Avg. Dealer Rating: (3 reviews) "We did not purchase vehicle, however the owner was extremely friendly and knowledgeable. Will definitely consider when back on the market for a vehicle. " Avg. Dealer Rating: (19 reviews) "Although we went with a different vehicle and dealer. I was contacted almost immediately by Troy Davis. In our brief talks, texts and email exchange, he was very courteous and professional. Very good follow through as well. Wouldv'e loved to purchase the Fj Cruiser but decided to go with a newer car with less miles. Thanks for the great customer service Troy!" Avg. Dealer Rating: (30 reviews) "Dealer was very patient"
Avg. Dealer Rating: (8 reviews) "Called Right away To Look at the car Everybody was very nice"
Avg. Dealer Rating: (202 reviews) "Responded offered test drive."